Record targeted music as MP3s from web radio stations. Every station & podcast! Record MP3 music from over 50,000 Internet radio stations for free. Automatically record from over 870,000 albums from 590,000+ artists. 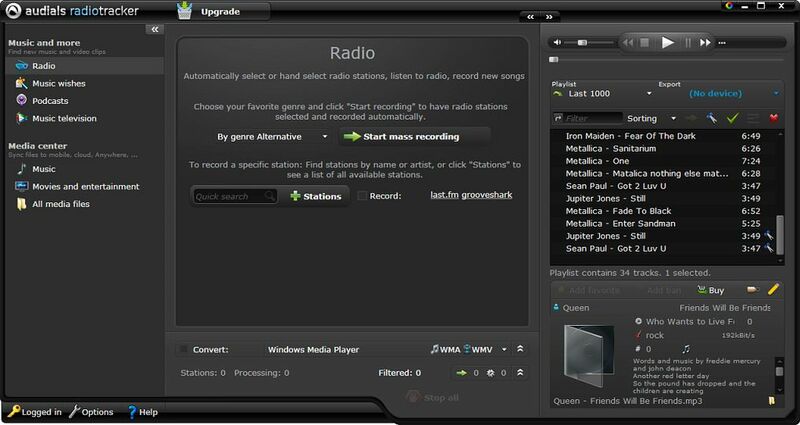 Just select an artist or album from the music database and click start. Audials Radiotracker monitors several thousand Internet radio stations and locates the right station to record your specified songs. Songs are recorded without any commercials or talk at all from radio streams automatically. Songs are recorded with fading at the beginning and end of each song and are normalized as MP3 or WMA files. The files are then automatically complemented with ID3 tags, song lyrics and album artwork. The music management function lets you conveniently organize recorded MP3s and existing music collections, transfer files to portable devices, burn them to a CD or even upload them to a Cloud storage. The integrated player lets you listen to Internet radio stations or play music playlists. The integrated Audio-Studio lets you post-edit songs or save them as cell phone ringtones. Furthermore, you can subscribe to, play and download podcasts. Best way to get new music by simply recording mp3 music from web radio stations with this software.Its easy use, has a huge database of internet radio stations plus all the recordings are saved as mp3 files in good quality. Finally can get all the music I like fast and without any hassle.